It’s been a little slow around the charter dock at Los Suenos the past few days. There have been a handful of boats going out each day and they have been catching a good mix of fish. One of the 42’s released 6 sailfish, kept one wahoo and 3 nice yellowfin tuna the last time out. One of the other 42′ released 9 sails yesterday. The 36′ Topaz had 9 sailfish bites a couple days ago and ended with 6 releases. The 38′ Custom released 7 sailfish yesterday with the clients hooking their own fish. 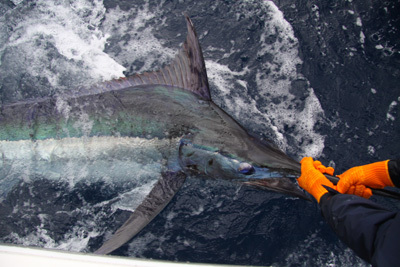 The 26′ Regulator today released a sailfish and a blue marlin on a 3/4 day trip. They also caught a nice dorado for the grill. So far green season seems to be right on time. Our days have been mostly sunny and really nice and we have been getting some evening showers that last an hour or two. It’s a nice break from the 90 degrees and blazing sun everyday. This entry was posted on Saturday, May 1st, 2010 at 12:44 am and is filed under Uncategorized. You can follow any responses to this entry through the RSS 2.0 feed. You can leave a response, or trackback from your own site.